Moots Routt review - LA VELOCITA. 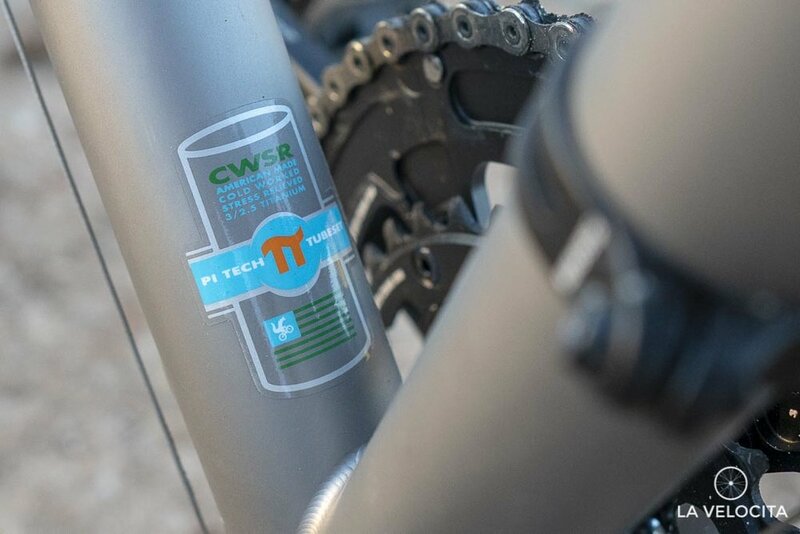 Recently, Treadly Bike Shop celebrated becoming a Moots dealer by gathering people together to eat pizza, talk titanium, and compare market rates for used kidneys that we could sell to buy a frame. Thankfully, I got to keep both kidneys and borrow Treadly’s Moots Routt build for a few days of gravel mayhem. I didn’t want to give it back. It was rather special. Treadly put together a classic “bike shop build” with well-chosen and solid value parts that are far more modest than you’d expect on this frame. It was all very sensible. Were I the kind of person who could afford a Moots (currently I am not) then I’d throw some serious bling at it. I’ve experienced a Routt in “modest” spec, so a high-end build will be something to behold. One cannot buy such a big-ticket item without buying into brand philosophy and there’s plenty of that to be found at Moots. I attended the Moots launch night and listened to one of their reps talk about Moots’s approach to making frames. It’s all very impressive. The first Moots frame rolled out of their Steamboat Springs, Colorado workshop in 1980. Steel was the material of choice for a decade until the lure of titanium proved too strong and their first Ti frame hit the tarmac in 1991. Since then the company has undergone a deliberately limited expansion to hit, what they believe, is the ideal quantity of 1000 frames made per year. Moots uses that productivity to access higher grades of American-made titanium, while still maintaining production quality. American Ti made into bikes by Americans in America. ‘MURICA! Do some sifting around the Moots website and you’ll see how much they value their staff. They all feature in videos about the company and each has their own biography, including 4 dogs and a small crocodile figurine that represents their mascot. Beyond the people, Moots has invested in plenty of high-end hardware to turn out their frames including 3D titanium printers, and a machine that just churns out their press-fit bottom brackets at the highest possible accuracy, or as Moots’s rep described it; “properly”. There’s no escaping the price of everything with a Moots logo. You get what you pay for though; the assurance of company longevity, experienced staff, pathological quality control, and very high-end hardware. The Routt sits in the “Endurance” sub-category of their Cross/Gravel frames. There’s three Routts available; the standard Routt reviewed, the racier Routt RSL, and the Routt 45 that’ll gobble up 45 mm tyres. The Routt is made from internally butted tubes that have been developed with metal masters Reynolds. That internal butting allows the tubes to have a wider diameter with thin walls, balancing strength and weight. Moots say the Routt’s maximum tyre clearance is 38mm. The chainstays are close enough to the low-profile G-Ones for me to confirm that’s true. There’s acres of space in the front fork if you wanted something wider there though. Geometry is tall and relaxed. The 55 cm frame had an easy-going 71.5˚ head angle, 160 mm head tube, stack of 601 mm and short reach of 373 mm. It’s something of an outlier among the modern gravel bikes that tend to fall a little closer to endurance road bikes with longer ‘n lower front ends. 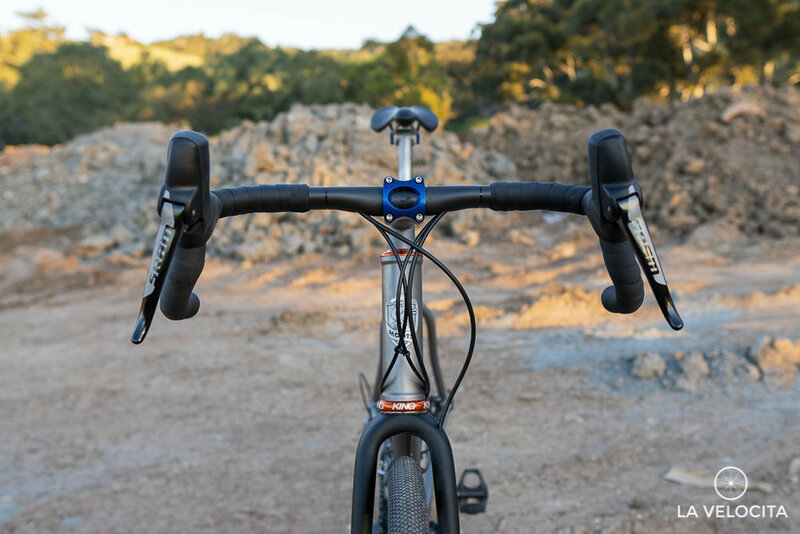 The rear tends to match most gravel bikes with 73.5˚ seat angle and a universal 423 mm chainstay length across all Routt sizes. The Routt has some gorgeous touches on it. The 3D printed flat mount brake section stands out with its subtly roughened texture. It’s an impressive solution to the precision needed for flat mounted discs. There’s rack and fender mounts on the fork and and rear triangle too. Even the guides that direct the externally route cables and hose have a smooth beauty to them. 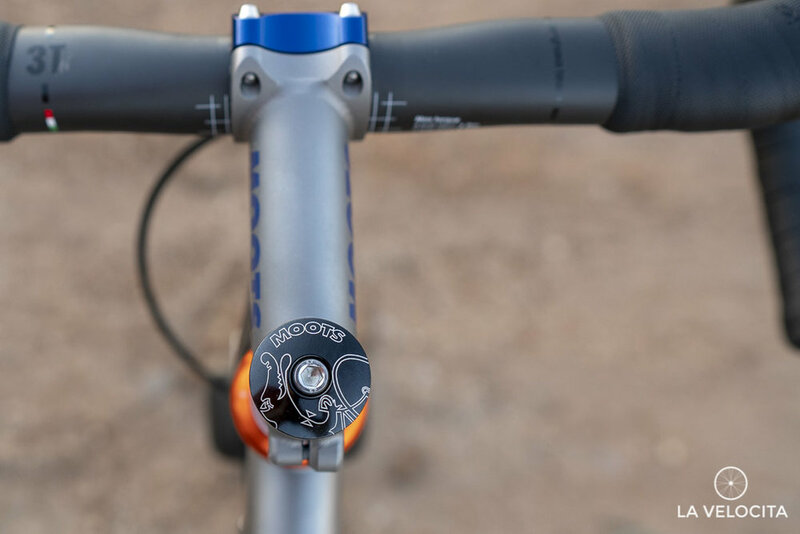 There’s multiple configurations available on-ordering including; slider dropouts, PF 30 bottom bracket, routing for mechanical and electric drivetrains, S & S Couplers, different finishes, and a few other minor touches. Looking over the geometry and build, one might expect the Routt to be a sluggish and doughy rig for weekend mixed-terrain dawdling. It isn’t. It’s a lively, responsive, and shockingly quick bike that transcends the sum of its parts. It lures you into riding it full-noise with a dopey grin on your face as fly along your favourite gravel tracks. It’s the best damn kind of bike; a relentlessly fun one. It all starts with the handling. The Routt is a nuanced bike to steer. It responds best to very subtle inputs at the front and hip steering at the back. The front end of the Routt is oh-so-chilled. You can roll along, hands off the bars for as long as you like. It tracks straight and true leaving you to do basically anything you want; like playing the violin or decorating a faberge egg. It’s just that stable. When the time comes to tip it in at speed, you just do it. The slack head angle means turning takes very little steering input. Give it some lean, and move your hips and it goes exactly where you want. Adding to the steering fun was the 3T bars. Their flared drops gave oodles of control and plenty of leverage to keep the bike going exactly where you want. Doing slower, more technical turns is a breeze for the Routt too as the slackness lends itself to low speed cornering. The Routt is a gravel and trail rocket. I hit up some of my favourite gravel tracks and a few of the less intense trails in the Cleland network. The exceptional smoothness and great handling let me barrel along faster than I’d previously gone on the same routes when I had a CX bike. Gravel roads are a dawdle, dispatched at great velocity if you choose. It handled less gnarly trails surprisingly well. I just couldn’t help going fast. The slightly-too-small setup meant I rode it almost like my rigid MTB; skidding sideways around the trails hanging my arse behind the saddle. I was seriously impressed at how spritely the overall package was. It accelerates and climbs better than a 9.1kg bike should. It’s not a stiff bike; with a small and expected flex in the bottom bracket, and quite a lot of flex from the titanium stem. It’s a very welcome flex in a gravel bike that improves the ride quality on rough terrain. Anyone who preferences stiffness in a gravel bike has their priorities all wrong. While not a standard build that’s offered by Moots, or Treadly, there’s a lot to like in the component choice that came on my test Routt. A couple of parts deserve special mention. Schwalbe’s G-Ones are brilliant. They’re very fast on tarmac and even faster on gravel. They were setup tubeless and I ran them at a plush 30 psi. It gave me plenty of grip and comfort, but I was at the limit of pressure for ploughing over tree roots and rocks. They have a reputation for wearing out quickly and getting overwhelmed with mud, but I’d happily run them for 8 months of the year. The 3T Superghiaia handlebars are hilarious and I was tempted to dedicate a review to them alone. They’re a road/gravel crossover that keep the shifters and first centimeters of the drops vertical before flaring out. They’re 400 mm wide measured from the traditional centre to centre width, and 460 mm measured centre to centre of the widest flared point. It’s a departure from other flared bikepacking/gravel bars that start their flare where the shifters are mounted. You get the best of both worlds with the Superghiaias; a traditional feeling road bar at the top with the extra control and superior leverage of flared drops. They’re very light too; tipping the scales at just 198 g. So what’s the catch? Well, they’re $449. But hell, if you can afford a Routt then I would highly recommend picking up a set. I want some for another of my bikes. They’re that good. The Moots Ti stem and seatpost are absolutely gorgeous, but are very pricey optionals. It’s $575 for the stem and $485 for the post. I liked the stem’s aesthetics and enjoyed the flex in it, but that price… The post felt great too but I’m always wary of Ti posts in Ti frames. It was silent for the days I rode it, but only time will tell if that lasts. Boy it was hard to poke holes in the Routt. It’s so damn good, but it’s not actually the Routt I’d choose if I were buying. For me, 38 mm tyre clearance is not enough for a bike of this type. I’ve been on a journey through gravel capable road bikes, CX bikes, and rigid adventure bikes and my lesson is that you should always buy more clearance than you think you’ll need. You want to take as long as possible, or ideally never, find the outer limits of your equipment. I’d steer people towards the Routt 45 for its extra clearance over the standard Routt. Chuck a set of WTB Riddler 45 mm tyres in a Routt 45 and you’ll be happily gravel grinding and trail bashing year-round. 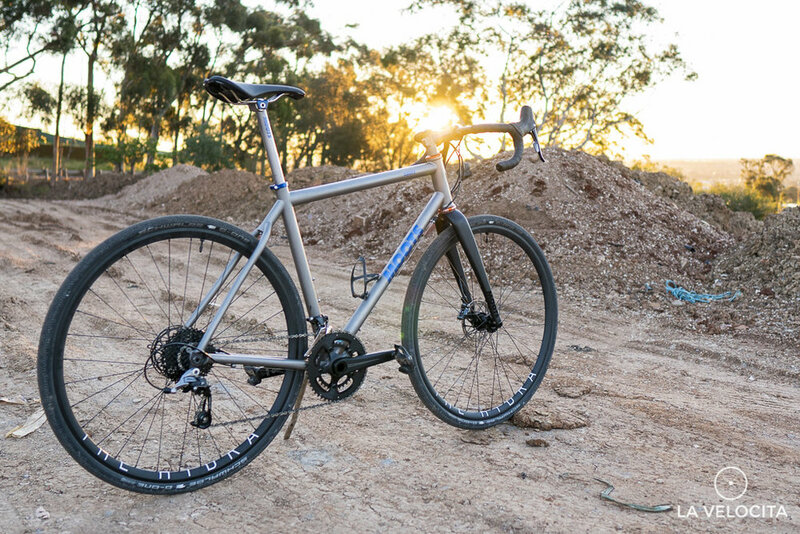 The geometry suits this style of gravel bike very well, but it’s a little far from a road bike to be that “one bike to rule them all” that the industry and customers are obsessed with finding. It’s a lot of fun on the road, but I’d still want something longer and lower for my mixed terrain rig. Something rather like, oh I dunno, the Routt RSL which is exactly a more aggressive Routt. So, while I love the Routt, I’d probably buy one of the others in the family. The Moots Routt is an intoxicating frameset. Light, stable, smooth, fast, and most importantly; an absolute riot to ride. It’s built to an exceptionally high standard too. Now, before people get suspicious that I’ve been “too positive” about the Moots, you have to remember that short-term reviews are holiday romances. I got to ride a frame from one of the finest makers in the world, freshly built with new parts. Of course I had an absolutely brilliant time. I didn’t have to pay for it and don’t have to maintain it. It’s now back with Treadly where other people can dream about their own, more long-term flings with it. All that said, I’ve ridden a lot of bikes in the last three years. A lot. This one feels special, and unlike anything I’ve ridden before. Now, let’s talk business. I have been asked a lot of questions about whether I’d recommend a Moots frame, and whether the asking price is “worth it.” To the first; yes I absolutely recommend it. There’s a wealth of talent and experience in this frame and the preceding hundreds of words have hopefully communicated how wonderful it is to ride. The second point isn’t really for me to say. Niche high-end gear becomes hard to compare to other products because what sets it apart is what makes it expensive. American titanium tubing built in America and imported into Australia is not going to be cheap in the current economic climate. This isn’t my first Titanium rodeo. I have a Curve Belgie Spirit of my own and I can absolutely assure you that not all Ti frames are created equal. If you have the cash to splash on a Moots, I can’t imagine you’ll be disappointed. The Moots Routt is a dream bike for a dream price. It’ll remain a dream for a while, but I thoroughly encourage anyone with the cash and inclination to talk to your Moots dealer. Every Moots that lands in Australia will make me happy because I know how good they are. Plus it increases the chance of me buying one second hand one day! Big, MASSIVE thanks to Treadly Bike Shop for letting my take this thing. Any prospective Moots buyers in Adelaide should go talk to them. Disclosure statement: This bike was loaned for review and we receive no money or benefits for the sale of Moots.